I am totally obsessed with The Pioneer Woman. Ok I am obsessed with many cooking stars lately, but I have loved The Pioneer Woman for over a year now and am so excited she has a cooking show on the Food Network. Her show premiered last Sat at 11:30 am and is now in the fall line-up and will hopefully continue to air every Sat at 11:30 am. I will admit I am sad she took the Neeley's spot, but I am sure they will be back at some point in time. So I have already cooked two of her recipes from her first show: the creamy mashed potatoes, and the marinated tomato salad (yes I am a dork), and both were very delish! 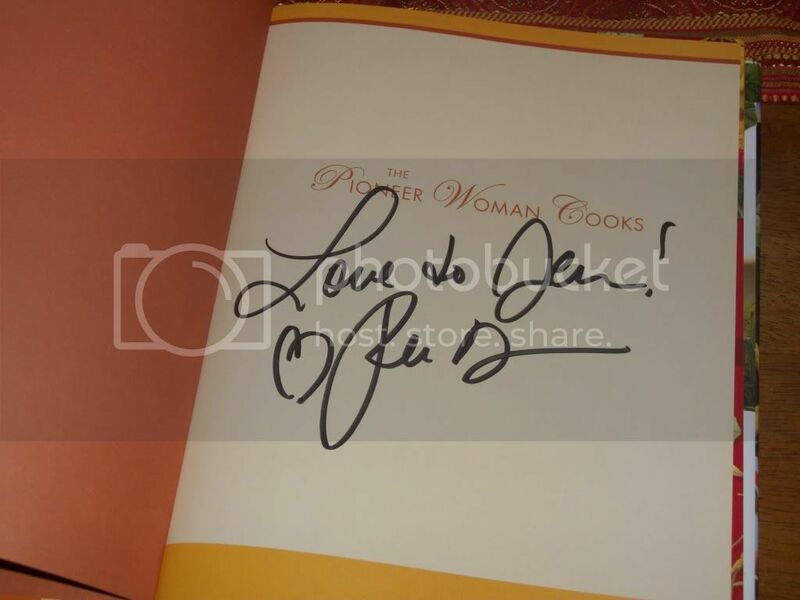 Last spring I actually had the opportunity to meet Ree at a book signing at Barnes and Noble. I was so shocked she would come to Columbus, Oh, and showed up at 8:45 am that day to stand in line to get a ticket. I was in the second group, so I must have been like the 30th person or so standing in line. I was able to get both her cookbook and her memoir signed (which I will treasure forever), and I also was able to get a picture with her. She was so sweet and seemed a little nervous, which made me love her even more. She is so funny and so down to earth. It really makes you want to support her and cheer her on! If you get a chance, check out her show tomorrow morning (Sat) at 11:30 am on the Food Network. Sounds like an awesome show, and how cool that you got to meet her!